Want to live in a home that is like a ship? Check this out! Once we see a home that has a unique design, we would tend to fall in love with it not just because of its uniqueness but also because we actually dream to have a house like that. Aside from the design, the home’s location may also have a huge impact to it like if it is seated on the mountain or is surrounded by a body of water. Speaking of waters, how would you feel if your home is actually like a boat since it appears floating and it can be accessed directly through the waters? Sounds very interesting, right? It sure is! So, if you are the kind who loves to swim or finds comfort by looking at the ocean or the lake, then this home will be a perfect inspiration for you. 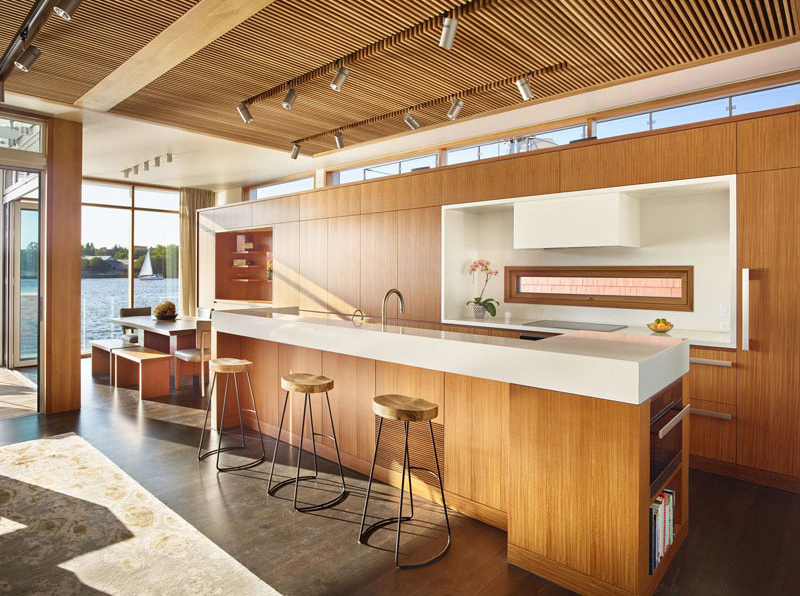 The Floating House is located in the heart of Seattle, which is an outboard slip on a dock on Lake Union with views west towards Gas Works Park. It is constructed on concrete floats that are 24 feet wide by 44 feet long; the homes on this dock are situated so that the shorter dimension faces out to the lake. For the layout of the house, the homeowner chose an inverted plan where the living spaces are situated on the upper floor, taking advantage of the view, while bedrooms are on the lower, float level. Lower level floors are rift-cut white oak and bathroom floors are finished with limestone tiles. Upper level floors are also rift-cut white oak but finished with an ebony stain. Cabinets are a combination of rift-cut white oak, finished naturally, and Afromosia, an exotic hardwood from Africa. 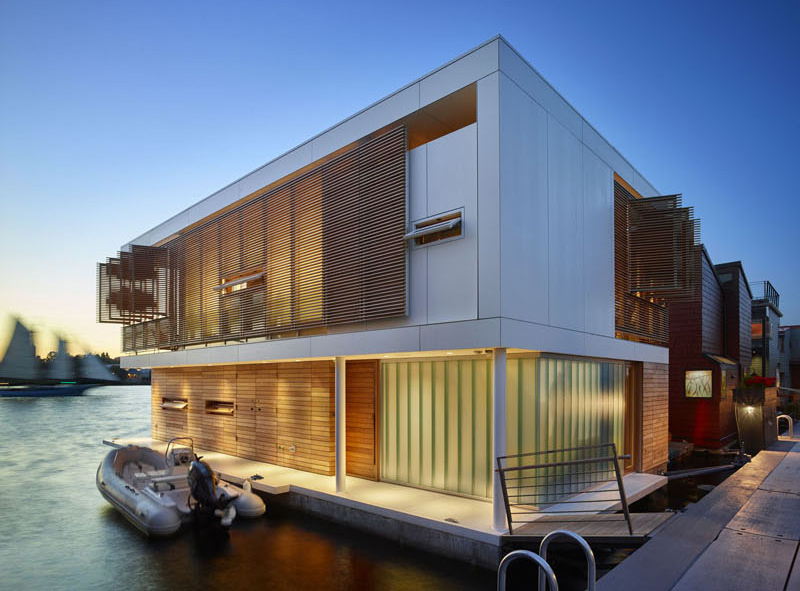 Scroll down and take a look at this beautiful floating home! Unique feature: This unique home is like a ship since it appears floating on the water. 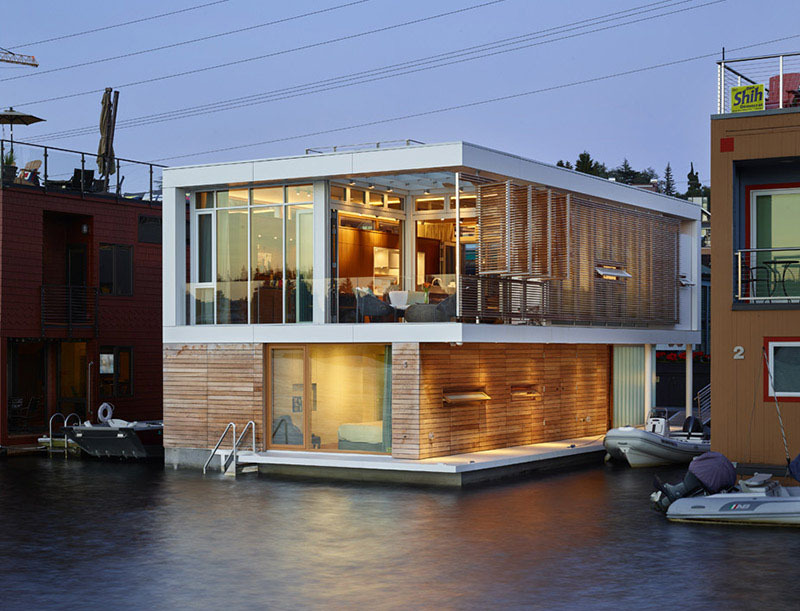 Designed by Vandeventer + Carlander Architects, this two storey floating home in Seattle, Washington, with views of Lake Union, has been constructed on concrete floats that are 24 feet wide by 44 feet long. Exterior materials were chosen for longevity and ease of maintenance. The exterior float deck and front entry floor are finished in white terrazzo. Lower exterior walls are clad in horizontal teak slats. Applied as a rain screen, the teak weathers to a silver gray. Stepping onto the float, one encounters a broad exterior deck that runs the length of the float; this deck leads to the front entry while also providing access to boat moorage adjacent to the float. 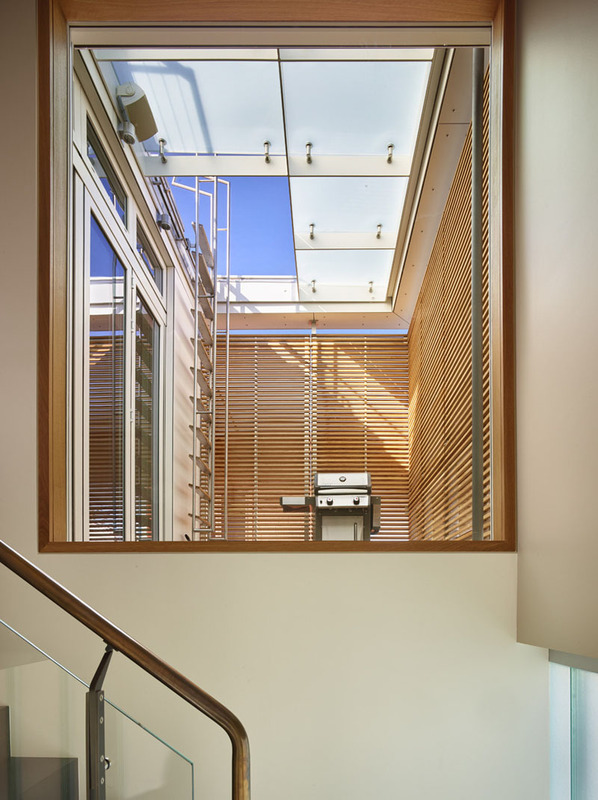 The front entry features two exterior walls of channel glass, allowing abundant natural light for the entry and stair yet maintaining privacy. Interior walls are primarily painted in a soft off-white color. Lower level floors are rift-cut white oak and bathroom floors are finished with limestone tiles. The living and dining areas open up to a small terrace, perfect for enjoying a drink while watching the sunset. 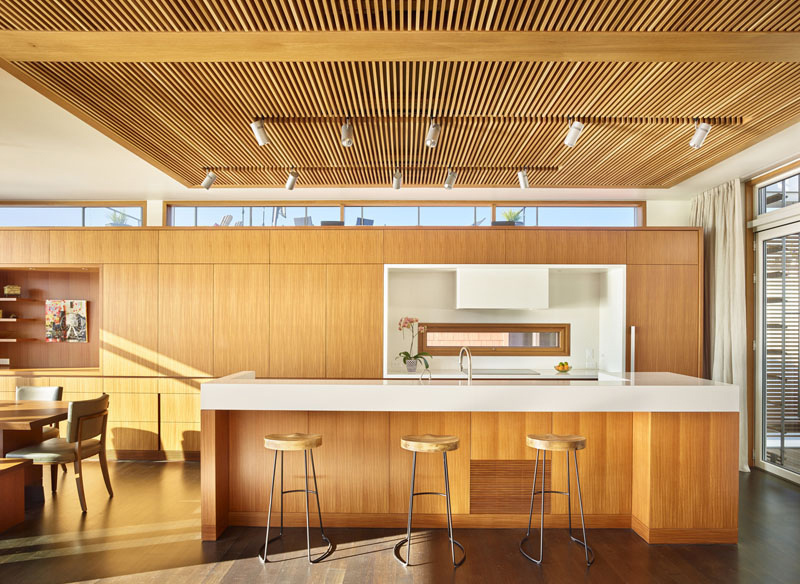 A wood slat ceiling in the living room and kitchen provides contrast to the surrounding white ceiling and walls. White touches have also been used in the kitchen, like on the island and cook top area. The north wall of the upper level is lined with a continuous wall of cabinetry serving both the kitchen and dining areas. A wood slat ceiling feature anchors the center of the space and provides contrast to the surrounding white ceiling and walls. 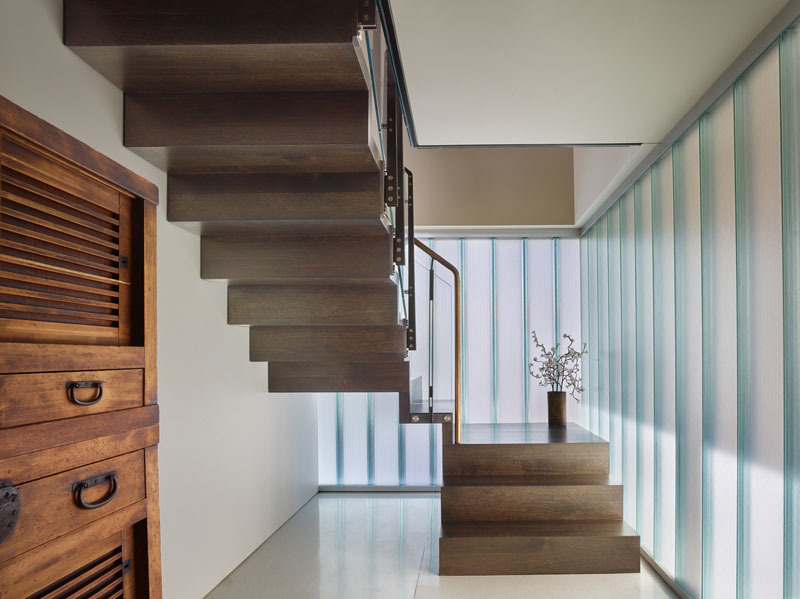 Inside, a cantilevered stair leads to the upper level while steps down lead to private bedroom areas. On the lower level, the master bedroom, dressing area, and bath are located to the west with views out to the lake. The second floor, which is essentially a single, open room, provides multiple activity areas to enjoy throughout the day. 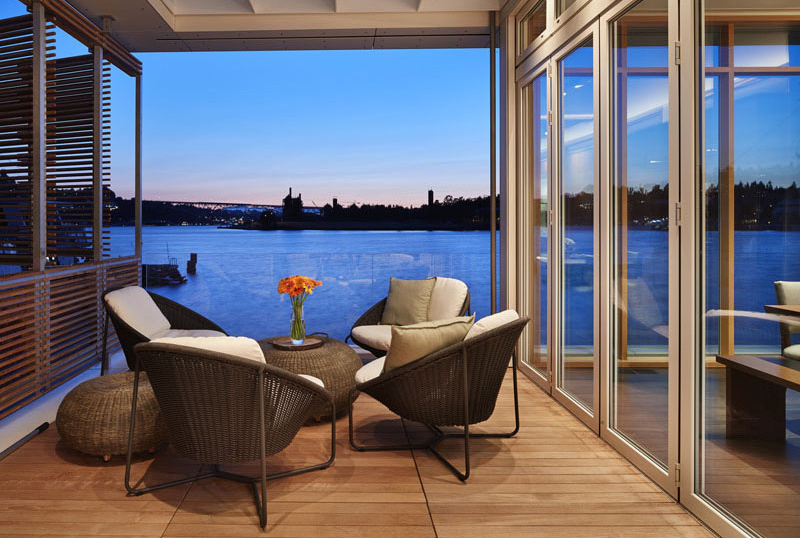 To take maximum advantage of Seattle’s limited sunshine, the owners desired both an eastern morning and a western evening terrace. The bedrooms are all located on the lower level of the float home, with large windows providing picture perfect views of the water. Frosted glass hides the toilet from the rest of the bathroom, and the flooring is made up of limestone tiles. The east terrace, adjacent to the kitchen, features a small seating area, provides access to a small roof deck, and has a dedicated barbecue area. The west terrace is located adjacent to the living and dining areas; two folding door wall systems allow the terrace to be shared by both. 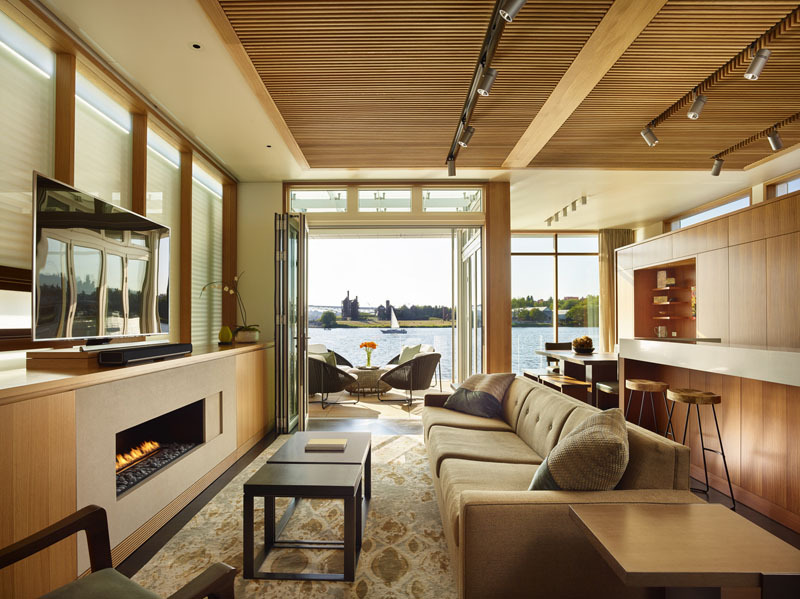 A diffused glass wall along the south side of the living area allows for even more natural light but maintains privacy from the neighboring floating home. This is indeed an interesting home! It makes you feel like you are living in a ship or in a boat because day and night you are seeing the waters. Another thing, it can be reached through the waters as well! This home is designed by adamsmohler.com – Vandeventer + Carlander Architects and it turned out into a wonderful residence like no other! Who wouldn’t love the design of this dwelling from the exterior to the interior spaces? It sure is something really inspiring as well. And this shows us that when it comes to home design, there are indeed no boundaries! 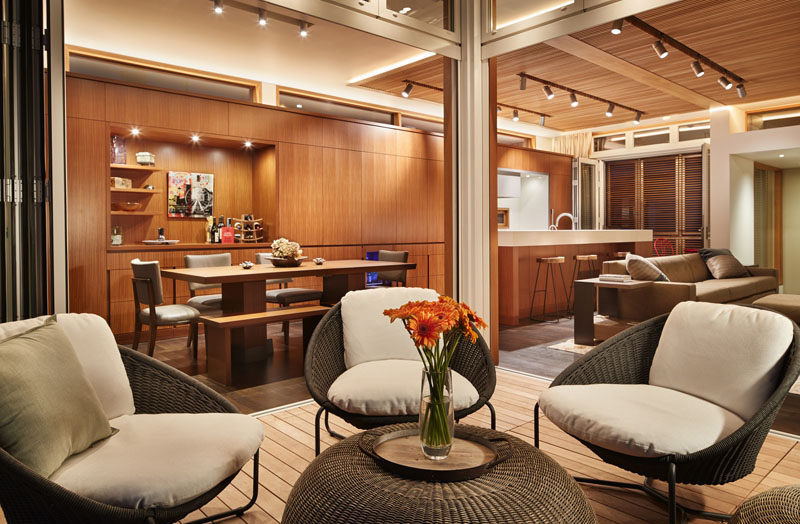 So, would you love to have a house like the Floating Home?